It's no secret that I have a slight dependency on lipstick — it's just one of those things that can instantly change the way you feel about yourself, going from blah to hey, gurrrl. 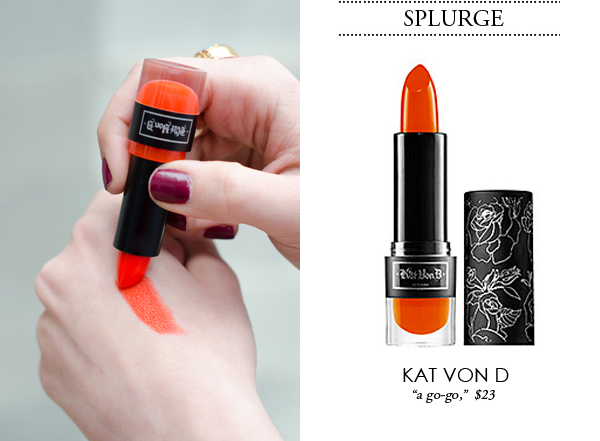 So when it came time to trade in my tried-and-true red shades in favour of some lighter options for spring (read more about that here), I figured orange was a good bridge between my go-to reds and the light pinks and corals I'll be rocking throughout the summer. It's one of those colours that looks good on just about any skin tone (hallelujah! 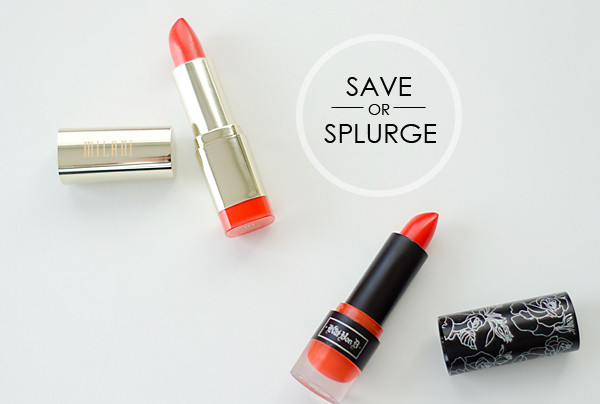 ), so when it comes to choosing an orange lipstick for yourself, only one question remains: Should you save or should you splurge? Milani is fast becoming one of my favourite brands for cheap-n-cheerful lipsticks — their colour range is good, the formulation is soft and creamy, and they seem to stay put quite well. Oh, and they smell like watermelon Bubblicious, which probably has something to do with my new-found devotion to them. 'Sweet Nectar' is a rich orange hue that looks amazing on and wears beautifully. I pretty much snapped it up the minute I saw it at Superstore, which is the only place I've seen Milani cosmetics here in Canada — if you know any other places they're sold, please let me know! Next up is Kat Von D's Painted Love Lipstick in 'A Go-Go,' which is pretty much the exact same colour as the Milani version. It's a little more pigmented and definitely has more staying power than 'Sweet Nectar' does, but I find it a little more drying on the lips. And although not outlandishly expensive, at $23 versus $5.50, I feel as though the biggest draw towards the Kat Von D version is the brand recognition... for my money, I say save on this one, ladies! I'm fairly convinced that orange lipstick is an awful idea for me. . . but I live quite close to a Superstore, and I'm in desperate need of a beauty routine change. Also, that shade looks very pretty on your skin, and I think we have similar skin tones. So I'm prepared to be wrong! And at $5.50, I can afford to try it out. Awesome! And if you're not into that particular shade, you're bound to find another one you like. I don't know if you wear a lot of pinks, but seriously, Flamingo Pose is amazing! And if you have the same colouring as me, you'll enjoy the fact that it makes you look more tan than you really are — bonus! 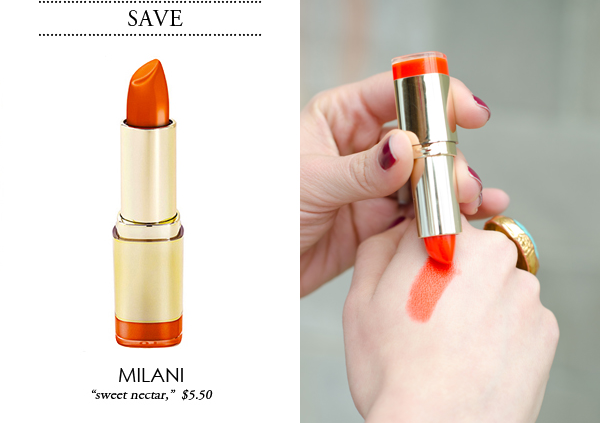 I think I'm going to have to get that Milani lipstick!